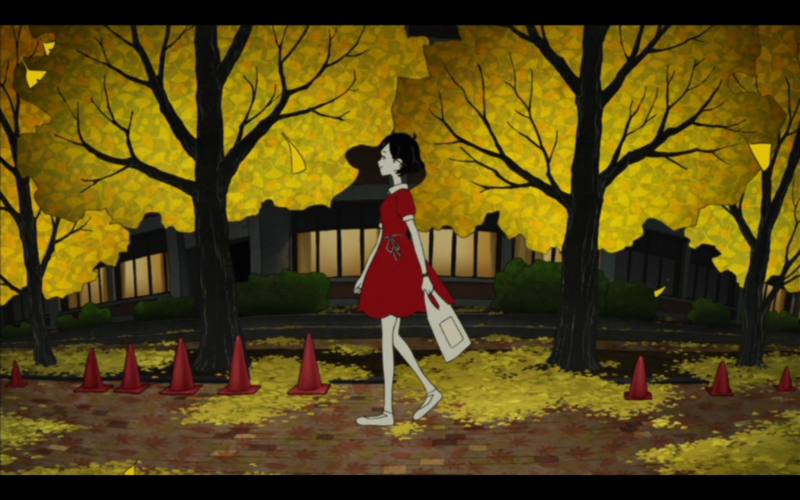 As a fan of anime series The Tatami Galaxy I was extremely excited when Anime Limited brought director Masaaki Yuasa’s next project, Night is Short, Walk on Girl, to cinemas. Both it and Tatami Galaxy are based on books in a trilogy written by author Tomihiko Morimi, so with this in mind, my hopes were high for what this movie would bring to the table. With Night is Short about to hit its home video release in the UK, does it live up to be what I wanted? When the movie was first released in cinemas last year, fellow Anime UK News writer Darkstorm was sent to review it. In her review she talked about how difficult it was to sum up just what Night is Short is about – and that’s true for me as well. In summary, the movie is about ‘Senpai’ who wants to confess to ‘The Girl with Black Hair’, his junior in university. Note that this work follows in the footsteps of Tatami Galaxy in neglecting to name its characters. On the night Senpai finally works up the courage to tell The Girl with Black Hair his feelings, she’s having a lively night out. The story that follows surrounds the mysterious things that happen to her and Senpai over the course of this night and the eccentric (but lovable) people they share their experiences with. Summing it up doesn’t even begin to do justice to what a wonderful film Night is Short is, though. Through the course of the 92 minute runtime we see The Girl with Black Hair in numerous different situations, including a charming book fair and a musical! Each story is connected and has two sides to it: what happens to The Girl with Black Hair and what’s happening to Senpai behind the scenes as he attempts to catch up with her. When these situations involve secret societies and the god of books, you just know you’re watching something that doesn’t even remotely take itself seriously. If you’ve watched The Tatami Galaxy previously then the humour and quirky storytelling on offer here won’t surprise you. 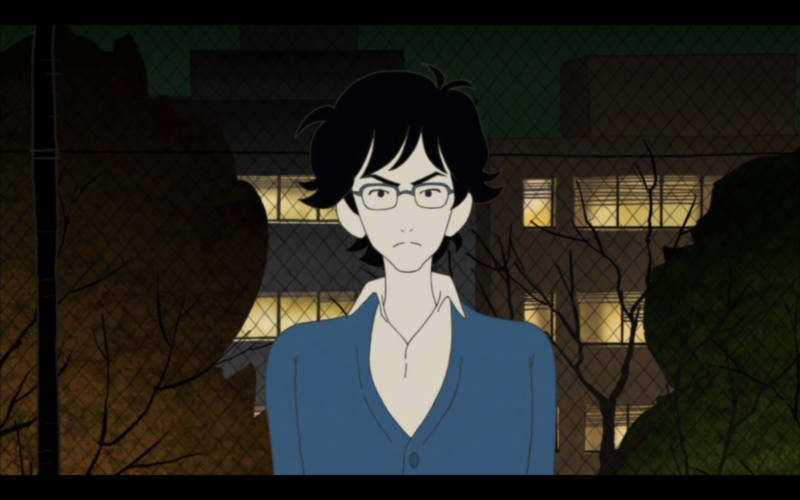 It might also interest you to know that various characters from The Tatami Galaxy turn up in Night is Short. The film never pins itself down to definitely being set within the same universe but the characters have largely kept the same personalities we’ve seen previously – so I like to think they’re one and the same. It’s not necessary to have seen The Tatami Galaxy before watching Night is Short but for existing fans like me it was a real treat. The story of Night is Short is a bit of an odd one because in some ways I think it would have been told better in an episodic anime format – but on the other hand it really does work as a film. While the setup of the film is meant to take place over the course of a single night, a lot of the stories do make you wonder if they’ve happened over a much larger time span. Even after watching the film twice I’m not certain what I think of the ambiguity of the timeline, but in the grand scheme of things this isn’t something that actively hurts Night is Short. Up until now I’ve not talked in-depth about the characters because I feel it’s extremely difficult to do so without spoiling key parts of the story. Both The Girl with Black Hair and Senpai have fairly simple personalities and are going with the flow of things, but their true charm is in how they interact with those around them. In fact, I’d go as far as to say that the characters aren’t the driving force of this film so much as the situations they find themselves in. That might seem like an odd thing to say but, for as good as these characters are, I don’t really see Senpai and The Girl with Black Hair as being that unique; much of the enjoyment purely comes from the story. 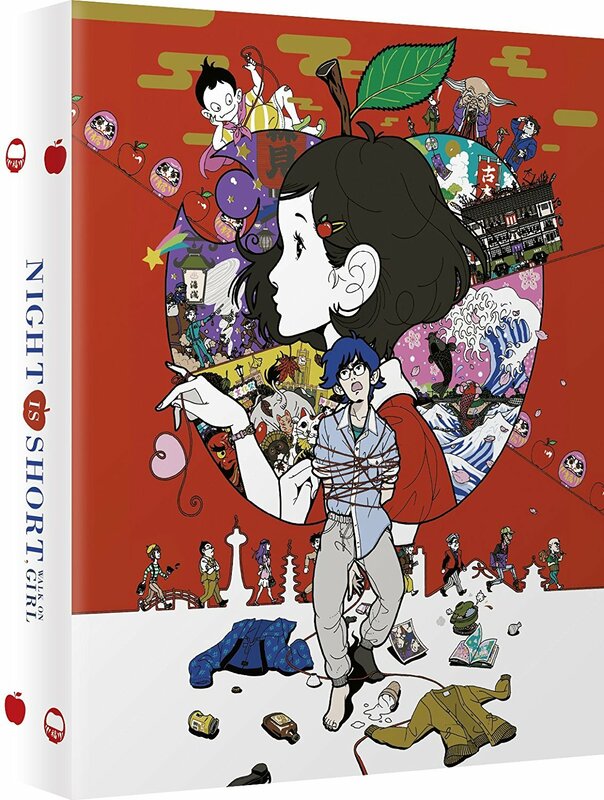 Animation for Night is Short has been handled by studio Science SARU (Lu over the Wall, Devilman Crybaby) instead of Madhouse, who adapted The Tatami Galaxy. 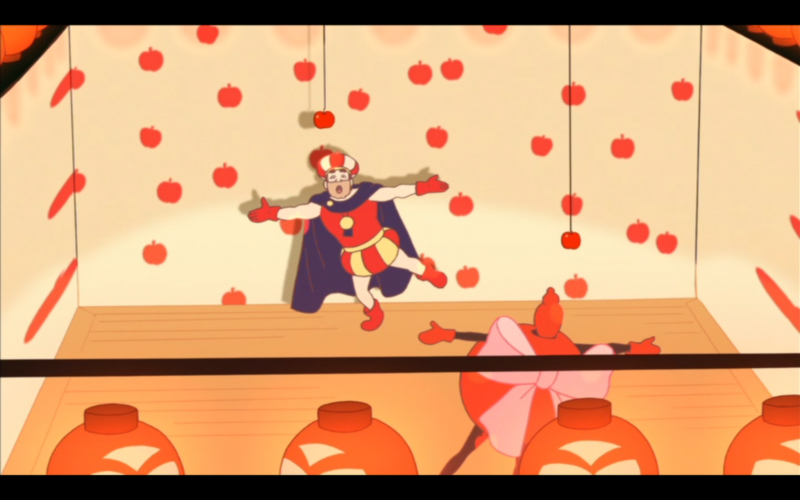 Due to retaining the original staff, however, the animation and director’s influences are still what you’d expect to see from a Masaaki Yuasa project. The interesting thing about Masaaki Yuasa’s works is that, as a director, he has a very distinct flair that doesn’t match traditional anime styles. It’s such a unique style that I think it could turn off some viewers but I always find myself enthralled with the colourful and quirky worlds that Yuasa portrays. Although Night is Short is not a fantasy work, the story often lends itself to fantastical elements and they’re always a great joy to watch in motion. The whole thing is a style you don’t see elsewhere and Yuasa does a good job of leaving his stamp on his projects. The soundtrack for the movie has been handled by composer Michiru Oshima (The Tatami Galaxy, Fullmetal Alchemist) and offers a really fun, pop-influenced score. I believe the composer is also responsible for all of the ‘musical’ tracks on offer in the later half of the movie and these are also well done (with some ridiculous but fitting lyrics). The ending theme for the movie is “Koya o Aruke” by Asian Kung-Fu Generation (who also created and performed the opening of Tatami Galaxy) and while it doesn’t sound that unique compared to other songs from the band, it works well within the context of Night is Short. Just a quick note regarding voice actors! While the cast is varied and full of some great VAs overall, I find myself most impressed with Kana Hanazawa (Hinata Kawamoto in March Comes in Like a Lion, Anri Sonohara in Durarara!! ), who plays The Girl with Black Hair. Hanazawa plays the carefree, sometimes ditzy role of The Girl with Black Hair well and provides a likable performance that is unlikely to put anyone off – which is especially important given this is a Japanese audio only release. This release comes to the UK thanks to Anime Limited and is available on DVD, Blu-ray and as a collector’s edition DVD/Blu-ray combo. The collector’s set comes bundled with a 52-page art book and if you order from Anime Limited’s store you’ll get an exclusive poster as well. As previously mentioned, this set does not have English audio; it’s Japanese only. Overall The Night is Short is a real treat for fans of Tatami Galaxy, but even if you’re a newcomer there is definitely plenty to enjoy here. With a quirky and whimsical way of storytelling, Night is Short is sure to win your heart.